Between the pollen and the bugs, the last few months have probably been tough on your car’s exterior. 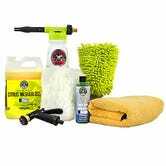 But you can give it some TLC with this Chemical Guys foam wash kit, which includes a foam gun that you attach to your hose, soaps, wash mitts, and a microfiber drying towel. The listed $64 price tag is pretty good for this kit, historically, but the 10% coupon on the page brings it all the way down to $58.